Long before Ellsworth began to dominate the cattle market, it was already a turbulent place. The Smoky Hills region had long been home to the Cheyenne and other Indian tribes who roamed the area killing buffalo. However, when the Santa Fe and Smoky Hill Trails came through, they began to raid wagon trains and stagecoaches, prompting the building of nearby Fort Ellsworth. As with other forts, a town soon sprang up nearby, some four miles to the northwest of the post, just beyond the military reserve. First surveyed in 1867, the town was called Ellsworth, though the fort changed its name to Fort Harker in the same year. With the railroad completed to Fort Harker in July of 1867, the new town quickly overflowed with frontiersmen of every kind, soon boasting more than 2,000 people. Within the first three months, the new town sported several houses, three grocery stores, a hardware store, dry goods, boots, and no doubt, a number of saloons. But for its quick growth, it also suffered a number of near fatal blows that first year. When the Smoky Hill River raged out of its banks it left the town standing in nearly four feet of water. At about the same time, a cholera epidemic broke out at Fort Harker, soon spreading to Ellsworth. Many of the city’s earlier settlers fled in fear. Those that stayed, soon moved the town site to higher ground to the west and the town began to prosper again. 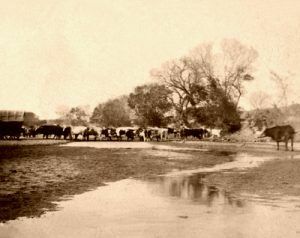 With the nearby railroad extended its line to Ellsworth, the town quickly developed into a thriving cattle market, dominating other Kansas cowtowns from 1871 to 1875. With the flood of cowboys, also came gamblers, outlaws and the inevitable “unruly” women. Ellsworth businessmen, anticipating the shift in the cattle trade from Abilene, moved the Drovers Cottage, once owned by Joseph McCoy, to Ellsworth in 1872. It could accommodate 175 guests and stable 50 carriages and 100 horses. Numerous other businesses also sprang up, profiting immensely from the cowboys. 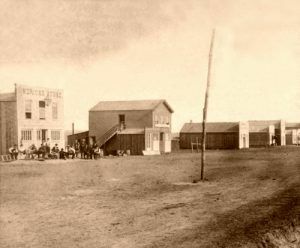 Like other Kansas cowtowns, Ellsworth quickly gained a reputation as a wild and wooly place, becoming the scene of numerous killings following shootouts between drunken cowboys. In its early days, the area was besieged by a gang led by two men named Craig and Johnson. Making frequent robberies and bullying the townspeople, the citizens finally organized a vigilance committee and hanged the two near the Smoky Hill River. In 1873, Ellsworth geared up for the largest drives of Texas Longhorns to date. Expecting trouble they hired additional police officers to control the rowdy cowboys. They would be needed when a dispute arose on August 15, 1873, between Texas gambler, Ben Thompson and another player named John Sterling in Nick Lentz’s Saloon. When City Marshal, “Happy Jack” Morco sided with the other player against Texan Ben Thompson, a known gunfighter, Ben and his drunken brother Billy, moved out into the street and called out to their opponents to meet them. Instead of Morco, Ellsworth County Sheriff, Chauncey Whitney stepped into the street with the Thompsons and soon convinced them to have a drink with him at Joe Brennan’s Saloon. However, before they could get there, marshal Morco charged down the street guns drawn. Thompson then wheeled and fired his rifle at Marco, narrowly missing him. Billy, on the other hand stumbled and discharged his shotgun mortally wounding the Sheriff Whitney. Ben and an army of Texans held off the town as Billy escaped. Ben was later arrested by Deputy Ed Hogue but was not tried and soon left Kansas, to later become the Austin, Texas City Marshal. Billy Thompson was able to avoid authorities until 1876, when he was returned to Ellsworth, stood trial, and was acquitted when the jury ruled that the shooting was an accident. After the shooting, all hell broke loose in Ellsworth. City Marshal “Happy Jack” Morco was fired and replaced by a man named Ed Crawford, who pistol whipped a Texas cowboy named Cad Pierce to death two days later. Obviously not confident in their law officers and tired of the Texas cowboys, vigilantes began to roam the streets issuing “affidavits” to Texans to “get out of town or else.” “Happy Jack” Morco was gunned down in the streets by J. Charles Brown, who later become the City Marshal. Edward Crawford, was also gunned down by a Texas cowboy, who was thought to have been Cad Pierce’s brother-in-law. With the cattle trade gone, the town then settled down into a peaceful ranching and farming community, which continues to be its mainstay to this day. Ellsworth now has a population of almost 3,000, largely supported by the Kansas State Ellsworth Correctional Facility. The area celebrates its rich history with a number of museums and attractions, including the Hodgden House Museum Complex on old South Main Street. Here, the spirit of Ellsworth’s Old West days continue as visitors are invited to tour the Hodgden House, built in 1873 by Perry Hodgden, one of the Ellsworth’s first settlers; the Black Wolf school built in 1912, a stone livery built in 1887, two historic churches, a rare wooden Union Pacific Caboose, the Terra Cotta Union Pacific Depot built 1900, and the oldest building in Ellsworth, its 1873 Jail. 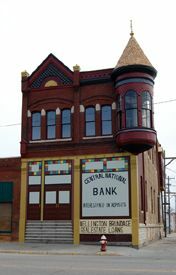 At 210 N. Douglas, the new National Drovers Hall of Fame Museum is currently being developed in the old Signature Insurance Building. Here, visitors will be able to learn about the Great American cattle drives from interactive displays in the museum. The Fort Harker Museum is located about five miles southeast of Ellsworth in the tiny town of Kanopolis, Kansas.